Place the peppers, salt, spring onion and flour into a bowl and mix well. 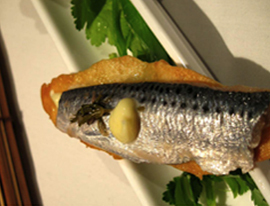 Place the sardine barrels into the flour mix and then dip in chilled water before either shallow or deep frying. Serve with a lemon dressing (mayonnaise).